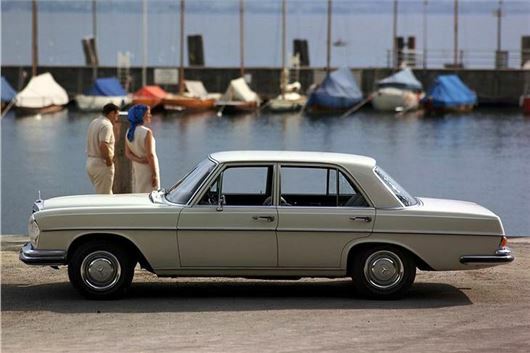 Mercedes was at the top of its game in the late 1960s, producing some of the best-made cars on the planet. Styled to perfection by Paul Bracq, the stacked-headlight W108 saloon was introduced in 1965 and was a masterclass in understated elegance, both inside and out. No wonder insurance giant Confused.com chose it to star alongside James Corden in their recent ad campaign. Cream of the crop was the 3.5 V8 version which came out in 1970 and sat between the quietly competent 158bhp 2.8 straight-six and the extravagantly bonkers 247bhp 6.3 V8. Widely considered to be one of the strongest engines ever made, the fuel-injected M116 3.5 V8 produced 200bhp and, driving through the mandatory four-speed auto 'box, it could propel the big saloon to 60mph in just 8.5 seconds on its way to a top speed of 127mph. Smooth, silent and utterly reliable, it was the perfect engine for a car which made granite feel flimsy. Drive a 3.5 today and it is still impressive in a way few other classics can manage, radiating quality from the moment you insert the key and silently unlock all four doors pneumatically. Pull the door to with a dull thunk, settle back in the wide armchair, survey the austerely elegant instruments set in a timber dash with chunky chrome highlights, grasp the huge yet dainty steering wheel – you already know that you are in something very special indeed. Fire up the majestic V8, experience the instant thrust as you surge away from the kerb and the feelgood factor is off the scale. Naturally such quality didn’t come cheap and at around £5500 new, the Merc was six times the price of a Ford Cortina and £2000 more than a Jaguar E-Type V12. Today though, you can still pick up a good 3.5 Saloon for about £15k which is crazy when you consider that the mechanically identical Coupe version is now routinely fetching £80k+ at auction and the Cabriolet version is fetching £250k+. Built to last a lifetime; everyday usable; cruises at three-figure speeds all day; seats five in comfort; timeless good looks; all parts readily available – the 280SE 3.5 saloon ticks all the right boxes. Your main problem will be finding one: only 11,309 were made in total between 1970 and 1972 (plus a further 951 in long-wheelbase W109 SEL form), all but a handful in LHD. However, they do crop up from time to time – we found ten RHD 3.5 W108s that have been sold at UK auctions since 2015 ranging in price from £6k to £17k – so next time you spot one for sale, grab it while you can! How many Mercedes-Benz S-class survived find out? The 951 pieces of long wheel based Mercs making them the rarest model within this series were the 280 SEL 3.5 which are W108 (with conventional suspension), not W109!